Peterhof as an open-air museum is absolutely weather dependent. The rainy and cold summer, with sparkles of sunny days, has kept it empty on one day and busy on the other. Nonetheless, the overall amount of visitors remained the same. Moreover, this summer, the museum was able to break its attendance record. In total 54 000 people visited Peterhof in one day. The director of the museum Elena Kalnitskaya has commented that such amount in the eyes of the museum's workers seems almost unreal. The day attendance record was reached in the Lower Park of Peterhof in July this year. 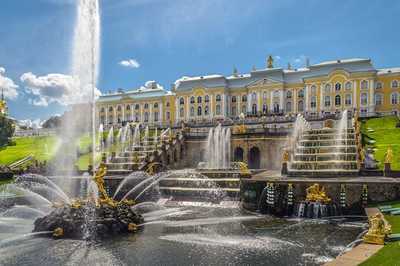 The state open-air museum Peterhof include more than 30 museums in four suburbs of St. Petersburg. The fountain system of the Peterhof is one of the largest in the world and includes 147 fountains, which operate in Upper and Lower Parks of former Imperial residence, which was established by Peter the Great in 1710th. The museum is one of the most visited in St. Petersburg, with annual attendance of approximately 5 million people. Among main attractions of the Peterhof, is the Grand Palace. Its carrying capacity cannot exceed 7 thousand people per day. This makes almost impossible for the solo visitors to attend it during summer days when it is almost fully reserved for the organized groups. For this reason, the museum makes an effort to establish new popular routes which would switch the tourists focus from Grand Cascade and the Grand Palace.